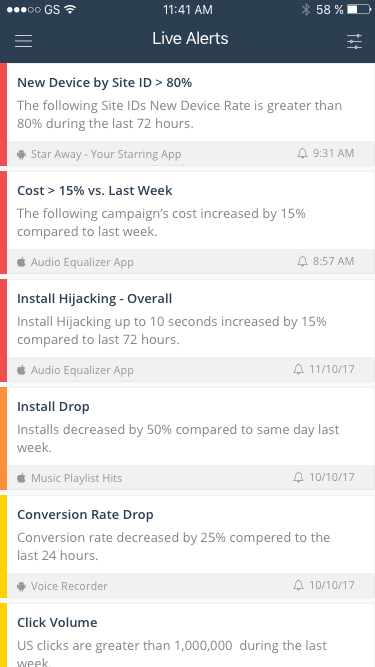 AppsFlyer's Mobile App allows you to keep track of your AppsFlyer mobile attribution and marketing analytics right from your Phone. 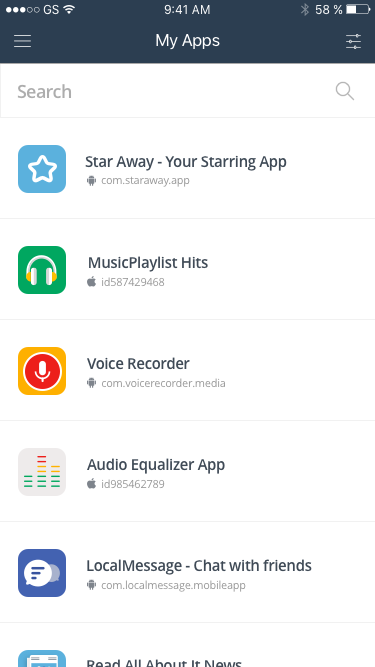 The app is free for all AppsFlyer customers. 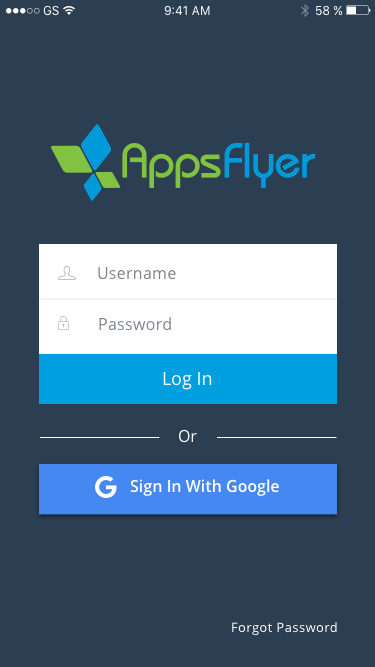 To log in to the app enter your credentials or sign in with Google. After login, the My Apps screen are displayed. This screen lists all the applications in your account. You can easily filter out apps from different platforms (iOS, Android, Windows) and even filter out pending apps. Tapping on an app name takes you into the app's overview screen. By default the top 5 media sources are shown for each metric. Each row displays the item, total for the media source and the share of this metric from the total. Clicking left or right on the date range moves the changes the dates by the time-span selected. You can also tap to select a specific bar and see its breakdown for a specific day. Tap outside the bar to reset your selection. The filter button in the top right corner of the screen allows you to change and filter your report. The filters menu allows you to filter by Media Source and Geo. 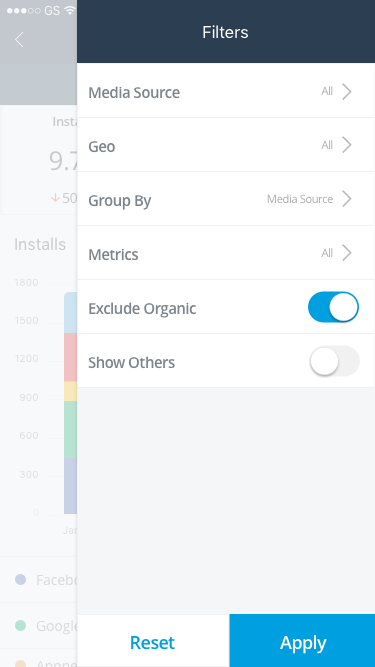 In addition, you can change the grouping of your data based on Media Source, Geo and Organic/Non-Organic. 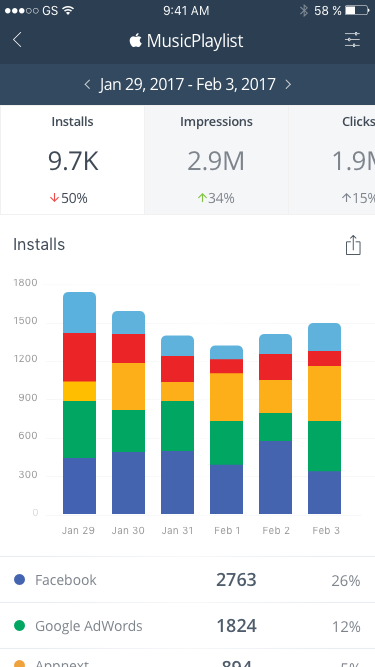 Finally, for even more control you can choose to filter out organic installs or view a grouping of all other data points not included in the top 5 filters you have selected. Tapping on the date range opens the date selector view. 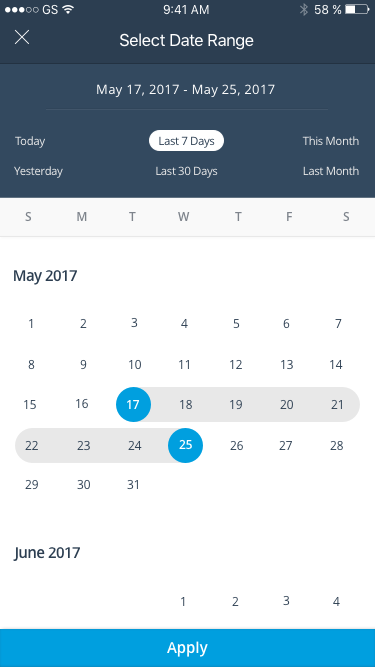 The date selector view allows you to easily switch between quick selection dates or select custom date ranges (select your required date range on the calendar). From the top-left Menu select Account Overview. 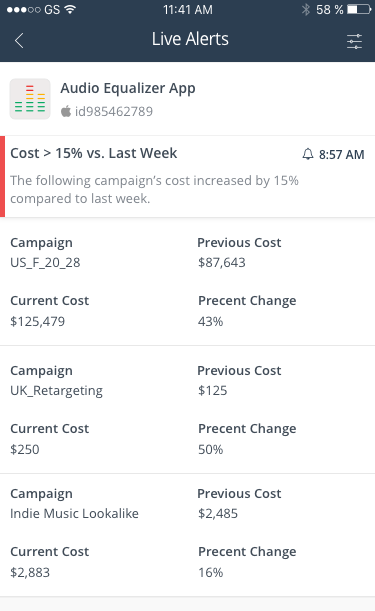 This provides an aggregated account level view into your marketing performance. 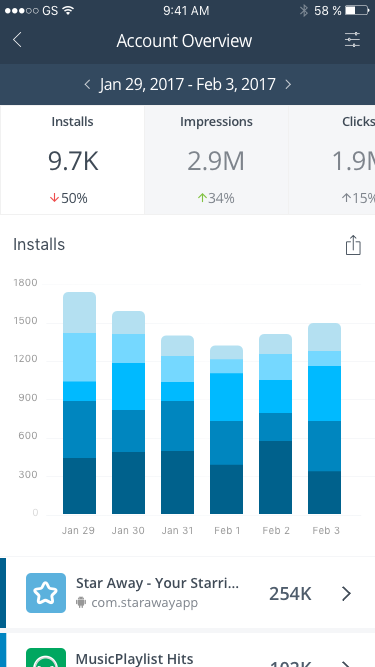 The same KPIs and filtering capabilities that are available in the App Overview screen are also available here. Tapping an app name from the list enables you to drill down into the App Overview for that app while maintaining the currently configured dates and filter selection. Push notifications are only sent to Alerts which have the AppsFlyer Mobile App channel configured. Make sure push notification permissions were granted from the Settings screen accessible from the Menu in the top left corner. From the Menu in the top left corner select Live Alerts. This provides a view on the all the configured Live Alerts from the web dashboard. Select an alert to view its details. The app currently does not support access to the partner dashboards and agency dashboards.